A Mile Square resident sent this email and graciously granted permission for it to be anonymously published here. While the sentiments are greatly appreciated, all comments from the community: positive, negative or neutral are always welcome: smartyjones@me.com. My wife and I are happy and privileged to call Hoboken home. It's a truly progressive community with the old-world charm that brings together a quality of life that is unique and unparalleled in the Garden State. Being around politics my entire life, in and out of the political trenches, I just wanted to write and say that you do a wonderful job. For the people who aren't in the thick of it daily, you accurately describe all of the forces - good and "evil." You truly do a civic duty. 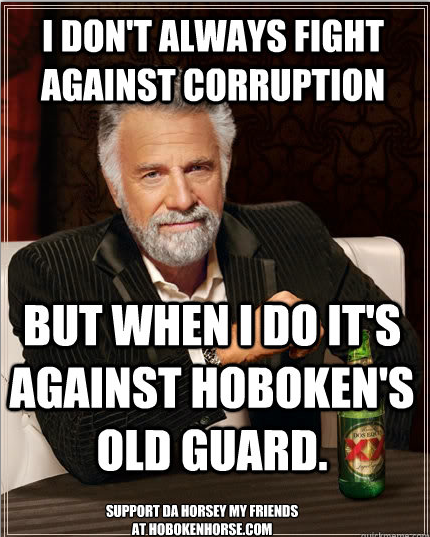 Some forces in Hoboken and Hudson County (and I've seen it first hand) are some of the most egregious and head-shaking forces I've ever seen. In the modified words of the immortal Rowdy Roddy Piper, "Just when you think you have all the answers, they (I) go and change the questions." We've made Hoboken our home and plan on being here until, God-forbid, the wrong people open up the containment chamber ala Ghostbusters and we see Stay-Puft marching down Washington St. destroying all the progress that has been made throughout these past few years. While much more is needed to do, there's light at the end of the PATH tunnel (figuratively speaking). Information is everything. The more people continue to read the content on this site, the better off our town will be from the selfish and morally corrupt interests that set progress back. Whether its shedding light on the Board of Ed, the Housing Authority, or even the Town Council, thank you for what you do. Here's to 2015 - the year sanity hopefully continues to reign. Talking Ed Note: While counte$$ must hear this political reality, her takeaway is the enemies of her ambition for power are Hoboken residents and is upping the ante in her war on the First Amendment and civil rights. More on all this, sooner than later. In the meantime, MSV continues to ask for the community's kind support as the malicious abuse of the NJ courts continues apace. So many are called but those who hear the call, well - you're the finest folks in our Mile Square land. Truly. Thanks kindly again to all of you who hear the call and continue to support MSV's efforts for decent and good government reforms in Hoboken. As you know, this War Horse is the tip of the spear.